Ten items. 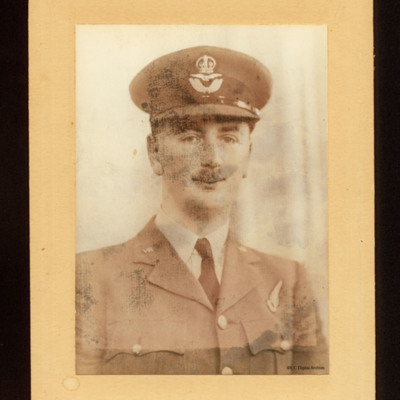 The collection concerns Pilot Officer Frederick Arthur Caunter-Jackson (84035, Royal Air Force) and contains a letter, air to ground photographs, an obituary and a photographic portrait. Frederick Caunter-Jackson was killed 11/12 June 1941 flying as an observer in a 61 Squadron Hampden on an operation mine laying in Kiel bay June 11/12 1941. The collection has been loaned to the IBCC Digital Archive for digitisation by Robert Jackson and catalogued by Nigel Huckins. Head and shoulder portrait of Frederick Caunter-Jackson wearing tunic with observer brevet and peaked cap. 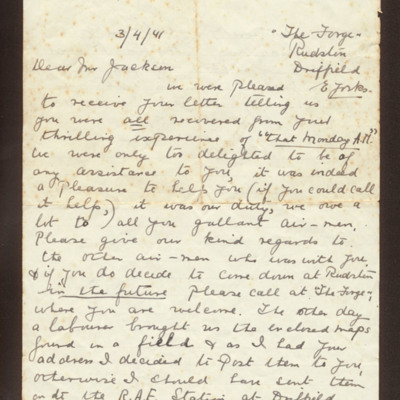 Additional information about this item was kindly provided by the donor. 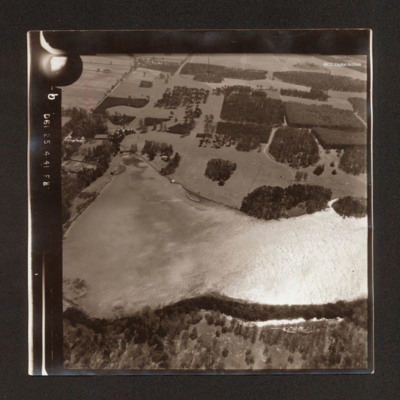 Oblique aerial photograph showing Narford Lake in the bottom half. To the top left of the lake is Narford Hall. Above the lake tree plantations in estate. 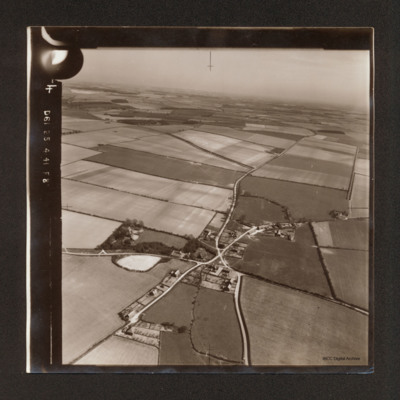 Oblique aerial photograph of Heacham surrounded by fields. There is the shadow of a Hampden one quarter way up from centre bottom. There is part of another exposure at the top. 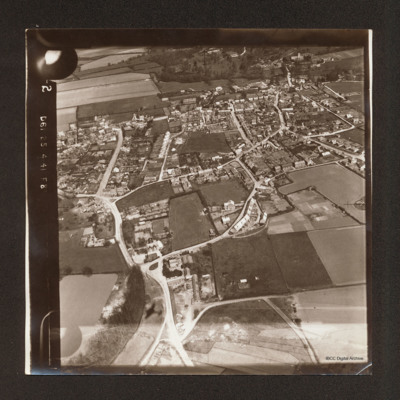 Oblique aerial photograph of Shernborne, roads running from bottom left to top right cross with road running from bottom centre to top right. Most of the view is of open fields. 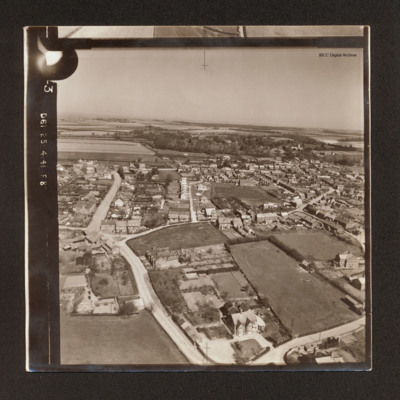 Oblique aerial photograph of Heacham with houses along roads. In the background open fields and woods. Oblique aerial photograph Flitcham. There is a country house with formal garden and estate in the top right quadrant with lake below and village in the bottom left quadrant. A road runs from bottom left to top centre. 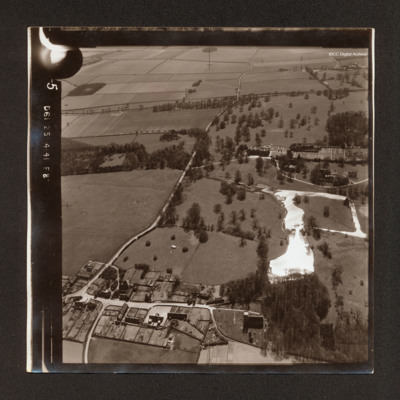 Oblique aerial photograph of Heacham surrounded by fields and with woods in the distance. 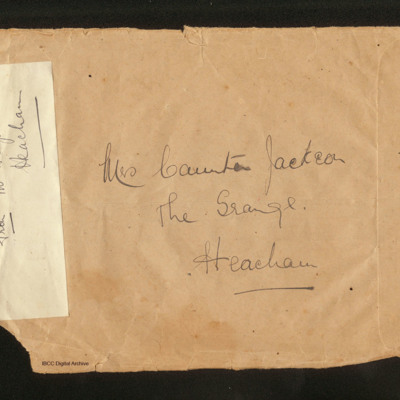 Front addressed to Mrs Caunter-Jackson. From [..] Jackson. On the reverse stamps and postmark Coventry 21 December 1943.